Sunday morning in Tokyo was Marathon time again. This was the 11th Tokyo Marathon, which began in 2007. 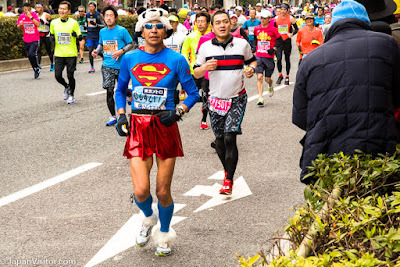 Man and Superman, Tokyo Marathon 2018Like most Tokyo Marathons, the weather wasn't great, being overcast, but, also unlike most Tokyo Marathons, it didn't rain. The rat race, Tokyo Marathon 2018 This year's winner was Kenya's Dickson Chumba, who also won in 2014, and, with a time of 2:05.30, shaved 12 seconds off his last win. Clowning around at the 25km mark, Tokyo Marathon 2018The fastest woman was Birhane Dibaba, of Ethiopia, who has a time of 2:19:51. The serious business of looking silly, Tokyo Marathon 2018I was in Asakusabashi in late morning to watch the show. The cheering crowds are often as spectator-worthy as the runners themselves, so my camera took in both. The race goes down Edo-dori Avenue, that runs through Asakusabashi, and the nearest side street to where we live was an example of traffic control overkill that I'd never witnessed before, being blocked off by a massive container truck. Initial impression, Tokyo Marathon 2018Enjoy the shots of the 2018 Tokyo Marathon as it happened at Asakusabashi.